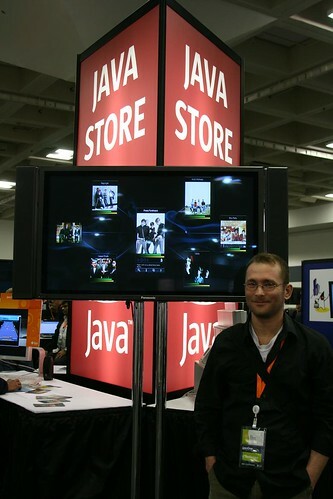 I noticed that Sten posted a photo from the JavaOne pavillion that happens to show the Music Explorer FX in the background. 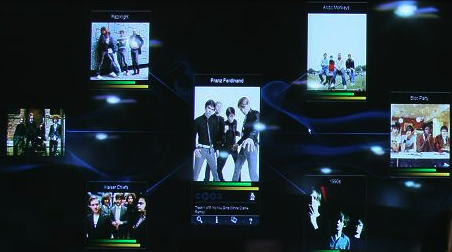 Here you can see Franz Ferdinand, surrounded by a set of similar artists, as well as a audio player, along with graphics that show familiarity and hotness (all derived from the Echo Nest). The Music Explorer FX is pretty neat. I hope Sten releases it soon. This entry was posted on June 9, 2009, 10:53 am and is filed under java, Music, The Echo Nest. You can follow any responses to this entry through RSS 2.0. Both comments and pings are currently closed. it’s “released!” anyone can register for the java app store beta, I got my “invite” immediately. and then it’s a free download there.